How Was This Picture Made #09? Home » Contests and Critique » How Was This Picture Made #09? This will hopefully be an interesting choice for the series, because I was challenged with a few issues when capturing the mosque. Unfortunately, I cannot disclose what the issues were, as they will give away the answer. So, how was this image captured and with what specific techniques? What is the approximate exposure time, aperture and ISO? Was the image captured hand-held or off a tripod? How was the image post-processed? Let the fun begin! Please post your analysis / guess in the comments section below! Looks like a wide angle lens shot. The horizontal lines are straight vertical, therefore I’m guessing a tilt-shift lens or you photoshopped to correct the aspect. Good guess? Seems like a wide angle lens like tokina 11-20 or sigma 8-16. ISO I guess would be 800 with aperture F8. Handheld I guess with shutter of 1/60.. This seems to be taken with tripod from a different building with a widengle, something in the 14-20mm range. Iso was pretty low 100-200 probably, since the dynamic range captured with this image is huge. And it seems to me that there were two exposures, one for the sky, one for the mosque. Maybe those two exposures were even 30 mins apart, so that you had perfect sky and lit up building. IMHO the picture has been taken with a wide lens or with a longer one but shooting vertical and merging it. Therefore a crop and a correction has been applied in postproduction. The aperture seems quite “normal” I guess an f/8 to f/16 but it depends on the sensor size. It’s clear and crispy so the ISO should be around 100/200. I suppose that the shadows has been opened quite a lot, the lights seems little burned so I think there’s no HDR here. Multilple Exposures at different times merged, dodged and burnt? Nasim, The sky is displaying various ‘Hues’ of Red-Blue’ and added to this is morning ‘Golden’ Sun Rays and ‘Silver’ domes of the mosque making it a High Dynamic scene. My take is to use a Tripod to shoot a HDR 3 shot pic for further Post-Processing of 3 layers. You have used 100-150 mm medium -tele lens to take this shot from your Hotel Balcony. Trust my settings are good. Looks like a multiple exposure from a Fuji X Pro 2 which you have used recently in Istanbul. The shot is tripod mounted. Multiple shots stitched in Photoshop. ISO settings 100-400. Lens – looks like a 56mm/70mm to me – not very sure. Aperture is between f6.3 and f11 given the depth of the shot. Nevertheless a good shot for sure. Nice composition. The ‘lighting’ seems to be coming from various sources and angles ? Tripod? Yes! Post processing? Yes! I think wide angle lense was used i think 18-20mm, i think iso is also low about 100 to 200, and the way the lighting is harsh on the dome definitely long exposure about 10 to 20 sec, and post processing reducing the highlights a little and bumping up shadows. Artificially lit from lower left. Wide angle on tripod, iso 200 f8. Wide-angle (corrected and cropped), tripod and multiple exposures (at least one around sunset and one a bit later for the lights in the courtyard) manually merged in PS or similar. Then the usual stuff (white balance, contrast, HSL, clarity) and a bit of dodge and burn. This is a panorama made handheld in manual mode of 4-5 vertical shots? I took the same shot at different time of the day. Problems during capture 1) WB: warm flood lights on the mosque and bluish sky. 2) getting the clutter out of the scene due to usage of wide angle. 3) high dynamic range of the scene. You have used wide angle lens probably as there is perspective distortion( bottom right tree and buildings at the corners). tripod used.f stop 9-11. ISO 100-200.Shutter speed is in few seconds. You have used grads either at capture or post. And during post you have had shadow recovery, noise reduction and contrast enhancement. I am cheating a bit since I know from your previous post that you have your Fuji X-Pro2 with you. So this would be from 10-24mm f/4. Definitely a wide shot because you cant see the top of the balcony on the minaret but you can see the top of the walls where half-domes sit. You are level with the windows just below the main dome. Your hotel is probably right next to the mosque that is why you needed the 10-24. It does not look extremely wide though. From the look of distortion I would say its between 18-24 mm. Aperture is between f8 to f11. Its really tough to say anything about iso and shutter speed from this downsized image. However I would use a base iso (100) and a tripod which would probably give a shutter speed of 1/10 to 1/20. white balance is set to the sky. that is why there is the pronounced yellow hue from the halogen lights of the mosque. I think this is a single shot. And you have played with highlights/shadow adjustments in the post. Fuji X-Pro2, Provia, Dynamic Range Setting to 400, therefore ISO 800, Tripod, 10-24mm, potentially in camera settings adjusted for lights and shadows (lower lights, lift shadows) or adjustment in LR later in post. Aperture around 5.6, therefore rather slow shutter time, maybe 1/30th ? Zone focus probably somewhere in the middle. Another possibility are three exposures with 1stop difference each and merged to HDR in post in LR. Doesn”t seem like rocket science, or am I wrong ? This is all about a cheap double exposure trick. Sky shot at sunset. Mosque and the building shot at night. Merge it & voilá. It appears that you took the shot from the Sultan’s Palace hotel or near there and facing southeast. The light on the smaller domes and the front of the mosques artificial. It does not appear that the sun is high enough in the sky to be reflected off a building. You can see that there are some spotlights shining on the front of the Mosque. The artificial lights are about the same temperature of the morning light or you adjusted the white balance. The lens would have been normal to medium telephoto, maybe the 35mm. You used a tripod and shot at f8 or f11. I agree with others that you used HDR or some other double exposure to balance the bright morning sky. I’m guessing that this required a large number of images that were stacked together using the median setting to remove people moving about. Looks like HDR shot, with 2-3 exposures on a tripod. ISO setting at low levels, based on DoF aperture is F8-11, exposure time still sub second. The clouds are not blurry so not composition of shots at different times.. One propable challenge is colour temperature, to match sunrise and the artificial lights at roof tops. On post processing side there buildings are straight. Lens is most likely around 80-135mm. Well, there is only one thing I am quite sure about and that is the focal length. It is a 24mm (fullframe equivalent).No tiltshift lens. I extrapolated this with the help of a 3D software. Other parameters are hard to guess, but I think it was shot in a normal aperture range 5.6-8. The exposure time was probably not overly long, since there is no movement on any twigs or some such. But then maybe it was just that the wind was exceptionally calm (the flag is completely slack on the pole). Standing on the roof of a hotel might mean that tripods are forbidden so, I believe it could be handheld at around 800 ISO @ half second exposure with image stabilizer or leaning on to something. Exposing for the highlights ( floodlights on the roofs are hardly burnt out) and lifting shadows in post. Aggressive sharpening visible in jagged edges on many structures. I have little reason to believe the sky was replaced though. Well my two cents worth would think the image was taken with a wide angle lens, maybe a 18mm, aperture 5.6, on a tripod, but not so sure, maybe the roof would not accommodate one due to the pitch, who knows. Some post processing for sure, but the image, nothing to write home about, post card shot. Given clarity a Tripod has been used unless the camera was placed on a balcony wall. Post processing could be done in a number of ways with HDR exposing for the sky, flood lighting, and non-lit areas. Or using layers and adjusting Brightness, Shadows, Highlights, and Saturation in parts of the picture to eliminate burned areas and shadows. On tripod, 24-70, guessing 35mm, bracketted image, Aperture f9-f11, ISO-100-200, PP by layering the bracketted images. Most important images were taken at different times of the day. Flag shows no wind so a fast shutter wasn’t required to minimize motion of the clouds and trees. The clouds don’t show smearing so the shutter time wasn’t too long. The vertical lines of the edges of the buildings at the edges of the photo diverge somewhat indicating a wider than normal lens, but the distance between foreground and background objects does not appear to be stretched out so the lens wasn’t overly wide. The image is sharp front to back indicating a small aperture. There is noise apparent at the horizon indicating either a high ISO or a lot of shadow recovery in post processing—I suspect the latter. So my guess is 24-35mm lens at f16 for 1/30 sec, handheld with shadow recovery and pink cloud enhancement in post processing. It is difficult to be precise without knowing if you were using a full frame or crop sensor camera. With a little help from Google maps it seems like you took this from on top of the Sultan Palace hotel, likely at sunset from angles of the shadows, illumination provided by the setting sun near the horizon, which also lit the clouds pink. Guessing something like F8, fairly low ISO, shadows boosted in post. Oops I misidentified the shadows. The light is coming from the left, which makes it the rising sun. Changed my mind again. Didn’t realize how much artificial lights there were in Mosque. I’d say this was taken when the sun is below the horizon, as most of the yellow light looks like it’s coming from the various lanterns laced around the mosque. If the sun was above the horizon the higher parts of the mosque should have more yellowish light than the lower parts, but the tall spires are largely unlit. I’d still vote for sunrise. Can’t really figure out from the scene whether the sun is coming from the left (East) or the right (West), but the scene is devoid of people. If it was at sunset there should be more people around on the various buildings. Makes more sense that people are still asleep at sun rise. Yellow light from artificial illumination. Shot from the roof of the Sultan Palace. Probably used tripod or propped on the concrete ledge of the hotel roof. It was probably on a weekend too, as people are sleeping in. I would say that this photo was shot shortly after dawn with the rising sun’s light full on the mosque’s eastern face, while their own outdoor lighting had not yet turned itself off. I’d say you used a white balance around 3800, with a medium f/stop around 5.6 with a relatively slow shutter speed, maybe 1/500 or so with the ISO around 800. It looks like you were slightly overexposed. I think you were zoomed out to maybe 300 mm, and maybe used some active-d lighting to bring out those soft blue tones. I can picture you waking up early and looking out the sliding glass door, and grabbing your camera when you saw the light. Whatever you did, it’s a great photo. and i guess it was handhled. This photo is taken at a single shot only in early morning. The color of sky speaks about the early morning color. The yellow tone in the mosque is the lighting of the mosque as we can see the shadow of dome. Indeed it is wide angle and longer exposure. Used tripod as sharpness will not come with hand held for longer exposure else VR works great as shutter speed seems to be around 1/5. Eagerly waiting for your comments about this photo to reveal suspense. The perspective on the buildings is odd. There appears to be keystoning from the bottom of the frame to above the center of the frame (the building behind the mosque to the left leans out, not in as I think it would if it were barrel distortion). So it looks like the camera was tilted away from the subject. Maybe that is what a tilt-shift lens does, I don’t know (I am new to all this). So it looks to me like the photo was actually cropped from a portrait layout exposure, although I don’t know why you would do that unless you thought the foreground buildings would look odd if the camera were not tilted up. It does seem like two exposures, unless they keep the mosques lit until daybreak in Istanbul. Please be gentle. Like I said, I am new to this. My guess is this was shot before sunrise. There are no people and several of the building lights are still on. Depending on how many minutes before sunrise (I’m guessing about 30), the exposure could have been 20-60 seconds, using a tripod. The challenge would be overexposing the lit area on the left side of the building in the foreground. Combining exposures in Photoshop or HDR could address this. 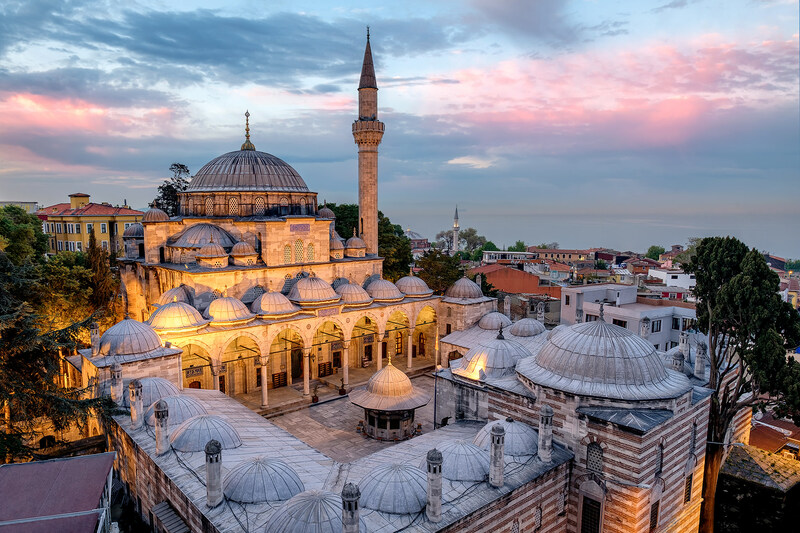 Another guess is the use of a soft graduated neutral density, with the darker side of the GND over the lower part of the scene, with the graduation starting at about the 2nd roof of the mosque. I am also making a wild guess that the focal length is between 15-20mm, but post process to correct the distortion. This resulted in about 30% of the lower half of the photo being cropped out. Just at sunrise, the sun rays are hitting the clouds to the right. ISO in the lowish range – 200 or 400 if taken with a Fuji. No HDR, the lights are too close to burning out. I will take a wild guess here. Your challenges were as following. You only had fuji xpro2 and 56mm 1.2 lens because the istanbul trip was not your photo gear trip. And the lighting condition from the sun was changing fast. No time to set up tripod. Brenizer method was used to stitch multiple shots together in post processing. You took photos in quick succession due to the fast changing atmosphere lighting condition. ISO 1600-2400. F stop f4 to f11. Hand held. Exposure 1/200 ish. I think this image was taken around 15 minutes after sunset at f5-8 55mm. And 10 second shutter..